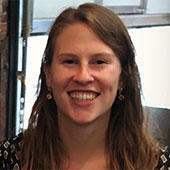 Meghan is starting the UX Research team at Factual, a startup focusing on location data. She’s establishing research standards and processes, benchmarking current products, and leading research efforts across all products. Previously, she was a UX Researcher at ADP, where she conducted a wide range of exploratory, concept-testing, and usability research across products and platforms. She was involved in ADP’s Come See for Yourself contextual-inquiry program, whose goal is to educate colleagues on the value of UX research and get them out into the field to talk to real users. Connect with Meghan on LinkedIn.